Property developer SP Setia Bhd declined to comment on speculation of a merger but stressed that it is on track to achieve RM3 billion sales target for 2011. The Edge weekly magazine recently discussed the potential of a merger between SP Setia and Sime Darby Bhd's property unit. Asked if SP Setia is keen on such a deal after a slew of tie-ups among big local property developers recently, president and chief executive officer Tan Sri Liew Kee Sin declined to comment except to say that the group will continue to grow and compete. SP Setia's sales target for 2011 would be 40 per cent more than the RM2.31 billion it made last year. 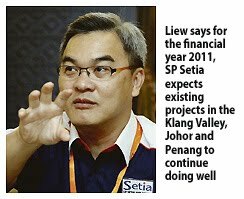 "For the financial year 2011, we expect all our existing projects in the Klang Valley, Johor and Penang to continue doing well," Liew said at a media briefing in Shah Alam, Selangor yesterday. "In addition, we will shortly be launching KL Eco City, our exciting new integrated green commercial development opposite Mid Valley City which should contribute strongly towards the targeted RM3 billion new sales," he added. SP Setia plans to launch the RM6 billion "green" mixed-development by January or February next year, he said. The project will be developed in three phases over at least 10 years and will be a joint venture with Kuala Lumpur City Hall (DBKL), which owns the 9.7ha leasehold land in the Kampung Haji Abdullah Hukum area. SP Setia is also planning a real estate project with a gross development value of RM1.4 billion in Australia by March or April next year. It will be on 0.4ha of land in Melbourne which SP Setia bought for RM92.4 million on March 29 this year. The company expects to build about 800 apartment units and some retail shops there. The developer has begun expanding overseas to markets such as Vietnam and China to tap Asia-Pacific's economic recovery. Liew said it is keen to grow its landbank in Malaysia which stands at 1376ha of undeveloped land in various prime locations within the Klang Valley, Penang and Johor. This is expected to keep it busy for at least another decade. SP Setia would build new townships or integrated commercial developments on any new land. "We love townships. They are able to generate big volumes for a long period of time," he said. Liew expects 2011 to be exciting and busy for the group and also the property sector at large. "Competition will be keen with more developers gaining confidence and launching new products which is a good sign of the health of the market as a whole," he said. For the year to October 31 2010, SP Setia's net profit and revenue reached RM251.8 million and RM1.7 billion, rising 47 per cent and 24 per cent, respectively. Projects which contributed to the group's strong performance included Setia Alam and Setia Eco-Park at Shah Alam; SetiaWalk at Pusat Bandar Puchong; Setia Sky Residences at Jalan Tun Razak; Bukit Indah, Setia Indah, Setia Tropika and Setia Gardens in Johor Baru; and, Setia Pearl Island and Setia Vista in Penang.